The commodity derivatives market in India was set up to serve the price risk management and price discovery functions. Commodity derivatives such as forex futures and Interest Rate Futures are hedging tools and are not for investment purpose. An important step to realise the full potential of a commodity derivatives market is to have a congenial tax environment so that the market can play a critical role in facilitating hedging, and mitigating volatility in prices, leading to efficient price risk management for market participants. India’s commodity derivatives are comparatively a lot more disadvantaged than any other exchange traded segment in the country. Unlike the equity market, which enjoys a congenial tax environment with various tax exemptions, a host of taxes are imposed on commodity spot and derivatives transactions. · The largest contributors to the equity market volumes are Banks, Mutual Funds and FIIs. They are not allowed to participate in commodity markets. Moreover, in terms of products, the largest contributors to volumes are indices, options and cash segments. The commodity derivatives markets are not permitted to offer these products for trading. · Trading in options and indices is not permitted in the Indian commodity derivatives market whereas it is permitted in the Indian equity derivatives market. · Derivative transactions other than those in commodities are recognised as ‘hedging’ for income tax purposes, even if they do not culminate in physical delivery of the underlying. This benefit is not provided to the commodity derivative transactions. · In the case of equity derivatives transactions, speculative losses are treated as business loss and can be off-set by profits while in case of commodity derivatives transactions, it is treated as “speculative” income, despite being a hedging platform. · In the case of equity derivatives transactions, short-term gains are taxed at a concessional rate and long-term capital gains are not taxed, whilst in the case of commodity derivative transactions, short-term and long-term capital gains are treated as “speculative”. Similarly in the case of equity cash transactions, business profits can be set-off by losses in equity derivatives transactions. However, this is not allowed in the case of commodity spot transactions. Imposition of transaction tax on commodity derivatives will increase the cost of “hedging” transactions, impair hedging efficiency, and will drive out hedgers. By increasing the cost of participation, the transaction tax will negatively impact the small players, Small and Medium Enterprises (SMEs), farm community, producers, processors, importers, exporters etc. They will lose out on a potent domestic risk management platform in the process. This will also lead to job losses and loss in incomes. The size of the illegal market in commodity derivatives is a few times that of the regulated commodity exchanges. Imposition of transaction tax on commodities market will further boost the illegal ‘dabba’ markets. Moreover, all the gains to the state and central exchequer because of the network effect of the commodity derivative exchanges would be drastically diminished with the levying of transaction tax on commodity derivatives transactions. BANGALORE- Copper Consumers’ Association of South India. “Any increase in cost of participation in commodity futures market through transaction taxes (if any), would have multiplier effect on our risk management strategies, posing big uncertainties to our industry. While increased cost will increase our direct cost of hedging in commodity futures market, the increased cost would also lead to fall in overall market liquidity, raising impact cost, which would further indirectly add to our cost of hedging,” said Mr. Jayaram Krishnappa, President, Copper Consumers’ Association of South India. In a plea to the Union Finance Minister Dr. P.K. Mandanna, Professor & University Head Department of Agricultural Marketing, Co-operation and Business Management - University of Agricultural Sciences has said, “If a transaction tax is introduced in this market, hedging will become too expensive for the hedgers and they will be left without any protection from commodity price risk. Farmers and other small producers will be the worst affected, as they are most vulnerable to commodity price risk”. The joint venture International Sleep Solutions Pvt Ltd (ISSPL) will manufacture 6000-spring mattresses a month. ISSPL aspires to do a business worth Rs.100-crore in the first year. ISSPL will get its second plant by 2014-15 and it would be located in Tamil Nadu. It’s in the process of exploring the Middle East and South African markets for its spring mattresses. Kochi, 31st January 2013: In pursuit of its global expansion plans, Eastern Mattresses Pvt Ltd (EMPL), which owns the popular SUNIDRA BRAND mattresses, on Wednesday, announced the formation of a joint venture, namely, International Sleep Solutions Pvt Ltd (ISSPL), in a strategic business partnership with Bam Furn Holdings, South Africa (BFH). “ISSPL will invest about Rs.10-crore to set up the new state-of-the-art factory. The plant will produce 6000 spring mattresses a month. And, ISSPL’s target is to do a business worth Rs.100-crore in a year’s time”, Eastern Group chairman Navas Meeran disclosed. ISSPL will manufacture and market superior quality spring mattresses across the country and abroad. ISSPL, according to Navas, will have an exclusive spring mattresses manufacturing facility located at Thodupuzha in Kerala. He said, BFH, besides making investment in the newly formed venture, will also offer cutting-edge technology and its undisputed marketing acumen thus creating a global cushion for the spring mattresses manufactured by ISSPL. The spring mattresses would be marketed across the country and abroad under the brand name ‘SUNIDRA.’ To start with, ISSPL will explore the Middle East and South African markets for exporting its spring mattresses, said Eastern Group Rubber Division General Manager (Operations), S.Rajesh. ISSPL will commence the manufacture of spring mattresses in the first quarter of 2013-14. “The setting up of the factory is in the final stages. So, we should be able to roll out the new product by May this year”, Rajesh said. ISSPL is also negotiating rights with one of America’s oldest bedding company to manufacture their premium range of bedding products for the niche segment of India. ISSPL will also have its second plant in place during 2014-15. “We’ve already firmed up our plans on this score. The second plant will come up in Tamil Nadu”, Navas revealed, releasing the new logo of Brand Sunidra. BFH subsidiary, Simmons South Africa Pty Ltd is a licensed partner of Simmons – world’s leading mattress manufacturer with a staggering 64 per cent growth in market share since 1986. SSAP holds uncompromising quality and absolute customer satisfaction in high esteem. “BFH and EMPL believe in offering highest quality products to the absolute satisfaction of their customers. It’s this common business philosophy that makes us natural partners”, explained BFH C.E.O and Managing director Iqbal Bam. According to him, the idea is to offer the most comfortable sleeping apparatuses to the customers based on continuous research and innovation. Bam Furn Holdings is a diversified group head quarter in Stanger, South Africa. Its subsidiaries are the leading manufacturers and retailers of Mattresses and Furniture in Southern Africa under license from Simmons USA and Eclipse USA. Eastern Mattresses Pvt Ltd is a member of the Rs.700-crore worth well-diversified Eastern Group of companies. It’s one of the leading manufacturers of rubberized coir mattresses with about 40 per cent branded market share in the state of Kerala and predominant presence in the rest of India. Confederation of Indian Industry is organized a Session on Cyber Security from 1000 Hrs - 1300 Hrs on 31 January 2013 at Taj Gateway Hotel, Kochi with the theme ‘Emerging Cyber Threats and Challenges’. This awareness session highlighted perspectives on Cyber Security related issues and its legal aspects from Government and Corporate side. The session had deliberations from Mr N Vinayakumaran Nair, Assistant Commandant Hitech Cell, Kerala Police, Mr C Balan, Joint Director, Resource Centre for Cyber Forensics, C-DAC, Mr Johnson K Jose, Assistant General Manager – IT, Federal Bank Ltd, Mr Yash KS, Founder & Chief Technology Officer, Red Force Labs. This awareness session was well attended by professionals from various sectors of the industry as well as students of Information Technology, Computer Science and Business Management. New Delhi, 30 January 2013: RBI Governor while unveiling the quarterly monetary policy expressed concern over the contrarian behaviour of food inflation which moved into double digits in December 2012, ‘reflecting both cyclical and structural factors’. During the period even though headline inflation rate fell to 7.2 per cent, food inflation remained high, revealing the critical need to focus on agriculture should the nation want to follow a growth oriented easy money policy. In fact the experience of the last two Five Year Plans reveals that for the Indian economy to grow at 9 per cent, it is important that agriculture should grow at least by 4 per cent per annum, all of which will not be volume growth. This will take more than 17 years to double the production. In order to double food production in the next 8 years we must grow at an annualised compounded rate of 9 per cent. This aim cannot be achieved unless India adopts targeted policies and practices on war footing. Given the fact that India is still struggling to accommodate the global developments in the food and agricultural sector of 1970s, a lot of time travel is needed to reach the milestone of doubling food production in less than 10 years. The nation will have to work at farm system-based solutions including use of advanced technologies from improved seeds through breeding and with beneficial biotechnologies, to irrigation technologies, to agrochemistries for soil nutrition, insect protection and weed management, mechanization, improved agronomic practices, effective post harvest management tools, amongst others in the future. The global markets are evolving. Farmers are already combining conventional practices with modern technologies and improved practices. Rising consumer demand and a changing climate need us to leverage knowledge-based research and development capability to develop new choices. With food, feed, the farm and farmer at the core. Tomorrow is for those who are determined to survive. The future belongs to new products, new processes with the goal to customize and personalize the products. Focus will be on improving crop productivity, functionality, enhanced shelf-life, safety and quality of food. For example, globally the seed and technology industry alone invest more than US$ 3 billion annually in R&D to develop new solutions. Similar amounts are invested by other agriculture inputs industries to develop products that are immensely beneficial to the farmers. Where will India stand? The agriculture sector today still supports more than 50% of the Indian population, while contributing only 14% of the national output. With increase in population and also in per capita food consumption the country is already in the midst of very high food price inflation; taking a severe toll on India’s masses. Crop Care Federation of India (CCFI) to address these critical issues of food security, agricultural sustainability and policies for food crisis alleviation is hosting the conference on ‘Doubling food production in five years’. The underlying premise of this three day conclusive convention focuses on reviewing current state of Indian agriculture, innovations, sustainable food policies and the effectual balance required for protection of ecology and environment while ensuring profitable agriculture for the farmer and a hunger free India and world. The conference is scheduled from February 1st to February 3rd 2013 at the Vigyan Bhawan, New Delhi. Today a number of government initiatives exist for the benefit of the sector including Centrally Sponsored Scheme on National Food Security Mission to enhance production, National Rainfed Area Authority (NRAA) focuses on problems of the rainfed areas, schemes of debt waiver for small and marginal farmers and debt relief for other farmers and Agricultural Technology Management Agencies (ATMAs) set up in 565 districts. Nevertheless there exists a clear need for coordinated action to even meet the food grain requirement of the proposed National Security bill. The conference will be inaugurated by the honourable President of India, Shri. Pranab Mukherjee. Honourable Union Minister for Agriculture, Shri.Sharad Pawar and honourable Minister of State for Chemicals and Fertilizers Shri Shrikant Kumar Jena will grace the occasion among other industry stalwarts, scientists and policy makers. Deputy Chairman, Planning Commission, Shri. Montek Singh Ahluwalia will deliver the key note address at a banquet in the evening. The proceedings of the first day will include a panel discussion on the role of key stakeholders in increasing food production, innovation in agriculture and extension work. The second day’s sessions include panel discussions on cooperation between government and regulatory authorities, role of seeds and GM crops in doubling food production, government policies & post harvest management, Agrochemicals and international experiences in agricultural productivity improvement. Some key panelists for the day comprise of Dr RB Singh, Dr Patrick Moore, Dr Ayyappan (DG ICAR), Dr. Mauricio Antonio Lopes (President, EMBRAPA, Brazil) and renowned economist and professor, Dr. Bibek Debroy (Center for Policy Research), to name a few. The final day’s events include the valedictory function which will be led by Smt. Sushma Swaraj, MP. This will be followed by felicitations and remarks by renowned speakers from various institutions, thus culminating the conference. Confederation of Indian Industry is organizing a Session on Cyber Security from 1000 Hrs - 1300 Hrs on 31 January 2013 at Taj Gateway Hotel, Kochi with the theme ‘Emerging Cyber Threats and Challenges’. This awareness session will highlight perspectives on Cyber Security related issues and its legal aspects from Government and Corporate side. As technology is developing very fast and the penetration of internet in the country is increasing and so do the activities in social media, the reach of cyber crimes too are on the rise. More and more individuals and organizations are becoming vulnerable to be the victims of cyber crimes. In this current scenario an awareness of different aspects of the Cyber world and an understanding of basic security measures can prevent most of the cyber crimes. The session will have deliberations from Mr N Vinayakumaran Nair, Assistant Commandant Hitech Cell, Kerala Police, Mr C Balan, Joint Director, Resource Centre for Cyber Forensics, C-DAC, Mr Johnson K Jose, Assistant General Manager – IT, Federal Bank Ltd, Mr Yash KS, Founder & Chief Technology Officer, Red Force Labs. This is an awareness session that is specially designed for IT managers and administrators from various organizations in the Government and Private sector. The session will also have takeaways for students of Information Technology, Computer Science and Business Management. For participation, please contact Mr Subodh (9447320793). Geojit BNP Paribas Financial Services today (12 January 2013) announced its third quarter results for the fiscal year 2012-13 following the meeting of its Board of Directors at Kochi. For the quarter ended 31st December, 2012 the consolidated income has gone up by 15% from Rs.58.78 crore to Rs.67.75 crore. Profit After Tax (PAT) for the comparable period has increased by 202% from Rs.4.3 crore to Rs.13 crore. During this quarter, the company’s Assets under custody and management crossed Rs.14,000 crore mark for the first time. For the nine months ended 31st December, 2012 the consolidated income has gone up by 5% from Rs.184.16 crore to Rs.192.81 crore. Profit After Tax (PAT) for the comparable nine month period has gone up by 355% from Rs.14.66 crore to Rs.66.77 crore, which includes an exceptional income received during the second quarter to the tune of Rs.36 crore on account of the sale of its stake in the JV with BNP Paribas for Institutional Broking. Geojit BNP Paribas Financial Services (www.geojitbnpparibas.com) is one of the leading retail stock brokers in India, with a strong presence in the Gulf countries. Listed on the National Stock Exchange (NSE) and on the Bombay Stock Exchange (BSE), it has more than 6,63,848 clients, a network of over 525 offices and manages assets worth over Rs.14,365 crore. BNP Paribas is its main shareholder. Geojit BNP Paribas has an extensive presence in the Middle East region via joint ventures and partnerships. Barjeel Geojit Securities, its joint venture with the Al Saud group is headquartered in Dubai, in the United Arab Emirates, and owns branches in Abu Dhabi, Ras Al Khaimah, Al Ain, and Sharjah. Aloula Geojit Capital Co., the joint venture with the Al Johar group in Saudi Arabia is headquartered in Riyadh with branches in Dammam and Jeddah. BBK Geojit Securities KSCC, located in Kuwait, is a joint venture with Bank of Bahrain and Kuwait and JZA. QBG Geojit Financial Services LLC is the joint venture with Qurum Business Group (QBG) and National Securities Co. and based in Oman. BNP Paribas (www.bnpparibas.com) has a presence in 80 countries with nearly 200,000 employees, including more than 150,000 in Europe. It ranks highly in its three core activities: Retail Banking, Investment Solutions and Corporate & Investment Banking. In Europe, the Group has four domestic markets (Belgium, France, Italy and Luxembourg) and BNP Paribas Personal Finance is the leader in consumer lending. BNP Paribas is rolling out its integrated retail banking model across Mediterranean basin countries, in Turkey, in Eastern Europe and a large network in the western part of the United States. In its Corporate & Investment Banking and Investment Solutions activities, BNP Paribas also enjoys top positions in Europe, a strong presence in the Americas and solid and fast-growing businesses in Asia-Pacific. Muthoot Securities, promoted by Muthoot M George Group has entered in to a tie up with UTI Infrastructure Technology and Service Ltd (UTIITSL), owned by Government of India to act as Income Tax PAN Service Centre. The company will accept PAN Card application through all Muthoot Finance branches through its representatives. Muthoot Securities have been offering it successfully in the South in 4 States and have issued 2,50,000 numbers so far. It is now planned to extend this service to North East & West states. Permanent Account Number (PAN) card is issued by the Indian Income Tax Department under the supervision of the Central Board for Direct Taxes (CBDT). Permanent account number allotted by the Income Tax Department is almost equivalent to a National Identification Number. The card also serves as an important ID proof. PAN is unique, national and permanent and does not change in lifetime. It is unaffected by a change of address even between two states. PAN Card will be useful and mandatory for many financial transactions. “There is an unfounded fear in the minds of many people that once they apply for PAN card, they will be subjected to the scrutiny of Income Tax Department. This has to be dispelled and non PAN Card holders have to be encouraged to apply for PAN Cards. We will ensure that the benefit of this arrangement reaches maximum number of beneficiaries for applying new PAN cards “ said George Alexander Muthoot, Managing Director, Muthoot Finance. To go deeper into the subject of creating a safe environment for women, CII has set up a Task Force led by Mr Subodh Bhargava,Past President CII who will lead the initiative and consult civil society, students and women’s groups apart from industry and submit its report to the authorities at the soonest. This was announced by Mr Adi Godrej, President, CII in a press statement issued today. The CII Task Force would also provide inputs to the Government formed Task Force, which is being Chaired by the Union Home Secretary, the CII release mentioned. The release said that crimes against women are of deep concern to all citizens of the country; this needs to be contained quickly and efficiently. Industry feels strongly that everyone should be safe through maintenance of good law and order. CII is deeply saddened at the passing away of the young student who was savagely brutalised in a moving bus in the most heinous manner. CII salutes the enormous fighting spirit of the brave girl, who put in her best in her battle for survival and in spite of her very painful and irritrivable condition, provided enough evidence which helped in nabbing the culprits. CII feels that the collective emotion that this incident has given rise to should not be allowed to dissipate. It is now time for all citizens of this country to stand together to create a regime which ensures that such heinous crimes never gets repeated. The Press release went on to say that CII feels that this can be done if, apart from other things, the legal system is deterrent enough to potential perpetrators of such crimes. This can be done if the judicial system ensures two things - that punishment is meted out swiftly and definitively within a specified time frame, say three months. Secondly the nature of the punishment should be exemplary and strong enough deter potential perpetrators. The CII release said that the apex industry body would work with business, industry and civil society in recommending contours of such a regime. CII will also look into aspects other than the law which have an overarching impact on attitudes and mindsets. 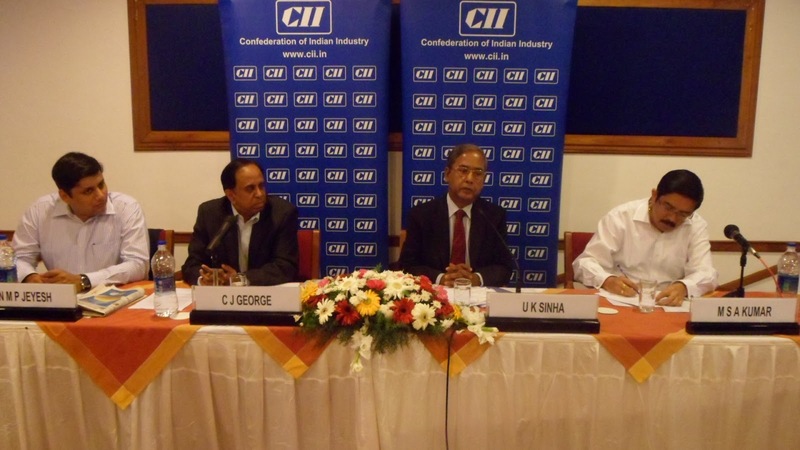 The Confederation of Indian Industry (CII) had organized an Interactive Session with Mr U K Sinha, Chairman, Securities Exchange Board of India (SEBI) on 29 December 2012, at the Backwater Ripples resort, Kumarakom. Mr Sinha while addressing the members stated that by June 2013 a total of 200 listed companies would comply with a new rule set by SEBI, which stipulates 25% public share holding. This in turn would infuse Rs 30,000 Crores worth of fresh shares into the Indian Stock Markets. Mr Sinha also mentioned that the money coming to the capital market has declined by 30 – 50 % across the world over the past few years. In India alone, a total of Rs 60,000 crore which was expected to come through the capital market had been shelved. Mr Sinha added that the 2008 Global recession resulted in the slowdown of economic activities in IPO markets across the world and this impacted India and decreased the country’s growth rate. But on a positive note, he pointed that the economic activities had improved post August 2012 and the potential growth rate of the Indian economy remained at 8% despite adversities. Mr Sinha also mentioned that SEBI is very keen to conduct handholding sessions for Potential companies in Kerala who are looking at IPO for raising capital. This would aid the companies in ensuring that they comply with all the stipulated rules and regulations. The handholding sessions would also include one – one interactions of the representatives of the company with Private Equity companies, Venture Capital companies, Angel funding companies etc. Mr Sinha happily shared with the Industry community of Kerala that he saw a positive energy amongst the various companies from the state which are poised to become global brands in the coming years. The SEBI Chairman was also positive about the overall economic climate of Kerala after listening to all the CEO’s who were present for the session. Mr Sinha also took this opportunity to announce the opening of a new SEBI Branch in Cochin by April ’13. Investors and companies in Kerala could utilize the branch’s services for the speedy settlement of their respective queries or complaints. Mr C J George, Vice Chairman, CII Kerala State Council and Managing Director, Geojit BNP Paribas Financial Services Ltd said, ‘Another major announcement of the Chairman was that SEBI would take initiatives in arranging meetings between startup companies in Kerala and Venture Capital companies, Private equity companies, Insurance companies and Mutual fund companies to ensure that startup ventures get guidance and assistance from them.’ Mr Sinha also added that strict action would be taken against Investment Bankers if due diligence was not done before issuing an IPO. The Meeting was attended by many Industry Stalwarts such as Mr Mithun K Chittilappilly, Managing Director, V-Guard; Mr Sanjay Vijayakumar, Chief Executive Officer, Mobme Wireless, Mr M S A Kumar, Managing Director, AVT Natural Products; Mr Krishnakumar, Rubfila International, Mr Srikant Suryanarayan, Managing Director, Tradelinks; Mr Manomohanan, Chief Executive Officer, Muthoot Caps Ltd; Mr George Lamannil, Executive Director, Muthoot Pappachan Group amongst others. In addition to this, top executives from Federal Bank, Cochin Port Trust and Geojit BNP Paribas Financial Services also participated in this session.